"Tangy and sweet with a great roasted flavor." Preheat oven to 425 degrees F (220 degrees C). Line a 9x13-inch baking pan with aluminum foil. Combine olive oil, salt, pepper, and carrots in a bag; toss to coat. I use the carrot bag. Pour the carrots into the prepared baking pan. Bake in the preheated oven until tender, about 30 minutes. 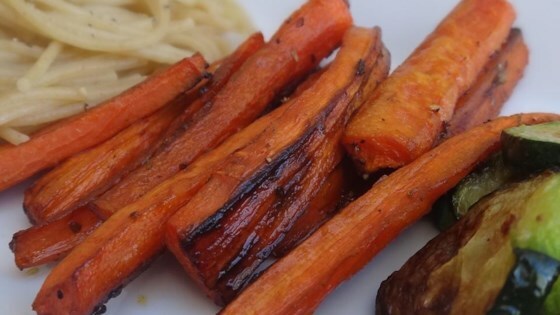 Sprinkle the balsamic vinegar over the carrots; shake the pan to coat evenly. Return to over and bake until the liquid is absorbed, 5 to 10 minutes. Serve hot. Great recipe but next time I might add some fresh thyme or something like that to make the flavor a little more complex. My husband loved these. Sprinkled 1/4 tsp of Cumin along with the balsamic vinegar.